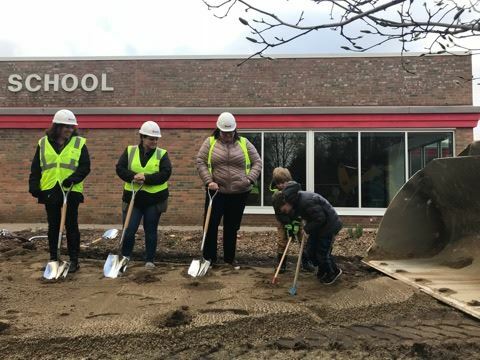 The East Lansing Board of Education, and other members of the community, break ground at Red Cedar Elementary on April 9. Around $10 million is being spent on renovations. East Lansing’s school board officially broke ground on Red Cedar Elementary, the first of six schools in the district set to undergo construction on April 9. The building will reopen in the fall. Community members, city officials, school officials and children attended the event, including Ruth Stump, president of the Red Cedar Community Association, a group that helped promote the reopening of the school. Stump said the international population surrounding the school and influences from Michigan State University made Red Cedar a diverse environment. East Lansing resident Liz Schweitzer, who is also a part of the Red Cedar Community Association, also spoke highly of what she considers an “icon” in the neighborhood. The school construction projects are being funded by a $93.77 million bond issue approved last year. Around $10 million is being spent on Red Cedar’s renovations. Superintendent Dori Leyko said school officials actually broke ground on the project in March, but thought the warmer weather in April would be more suitable for a ceremonial event. “We felt like this was an opportunity to bring our neighbors and community together to celebrate our first milestone,” Leyko said. In the summer, there will also be a ribbon-cutting ceremony and a tour of the renovated building. While school-age students in Ingham County are declining, only East Lansing schools are growing. The district does it with a combination of programs and the type of diversity that some families crave.